How can the Poggendorff illusion be used to breathe life into a static image? In the earlier posts, Advancing and Receding Forms and Portraying Movement, the discussion focuses on principles underpinning ways that artists portray movement. The present discussion adds another dimension to these principles by proposing how the perceptual conundrum posed by the Poggendorf illusion—the illusion observed when an angled line is overlaid by an shape resulting in the angled line appearing to be two separate lines set slightly apart from each other on either side of the overlaid shape (see illustration below)—can be employed to create an even more convincing representation of movement. Normally I would begin such a discussion with an overview of the illusion in terms of its discovery back in 1860 by Johann Poggendoff and the perception theories underpinning it (e.g. Thorsten Hansen’s new theory based on stereoscopic vision [http://www.twk.tuebingen.mpg.de/twk02/Ptaeuschung.html (viewed 6.1.2013)] and the earlier theories of angular displacement and depth-processing or constancy [http://psylux.psych.tu-dresden.de/i1/kaw/diverses%20Material/www.illusionworks.com/html/poggendorf.html (viewed 6.1.2013)]. But there is such a rich field of easily assessable information available on the Poggendorff illusion that I will move directly to how the illusion may be harnessed for practical artistic purposes. Rudolf Arnheim in his classic text, Art and Visual Perception: A Psychology of the Creative Eye (1974, pp. 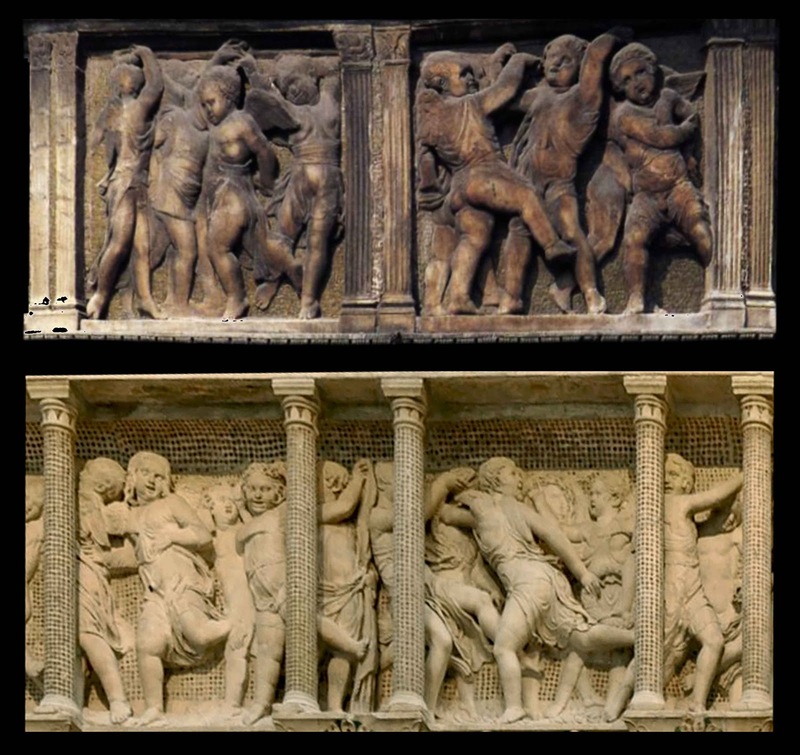 58–59) illustrates the effectiveness of the Poggendorff illusion by comparing Donatello’s (c. 1386–1466) sculptured frieze, Dancing Putti (1434-38), on the pulpit of the Prato Cathedral with the same artist’s Cantoria (1433–38) in the Museo dell’Opera del Duomo, Florence (see details of both friezes below). 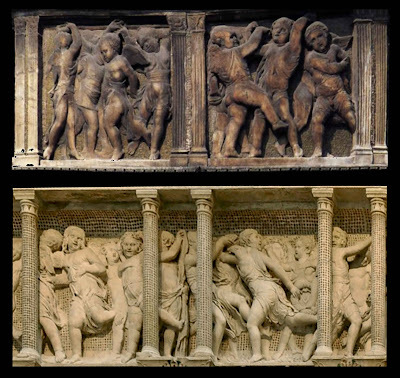 Arnheim points out that by framing the figures with columns on the sides of each group, as shown in the Dancing Putti (see upper detail), the figures do not appear to be as animated as when the columns are laid over them, as shown in the Cantori (see lower detail). 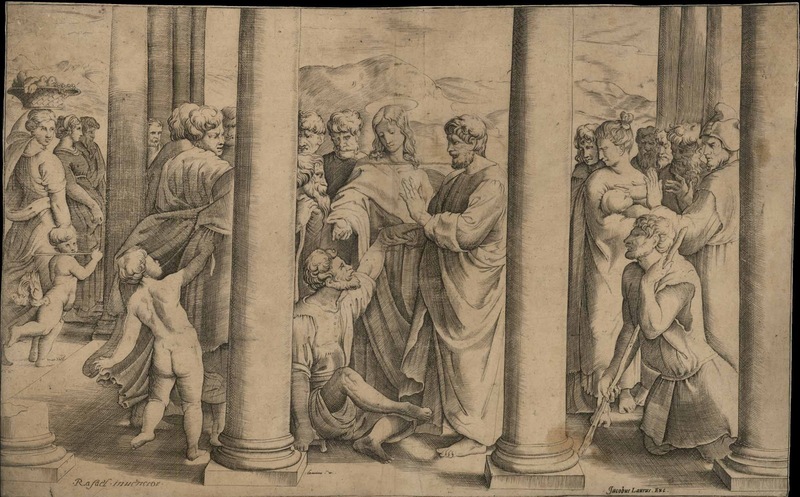 This three-dimensional application of the illusion in Donatello’s Cantoria is, of course, equally applicable to two-dimensional images as can be seen below in the two interpretative engravings of Raphael’s St Peter and St John Healing the Lame Man at the Gate of the Temple. 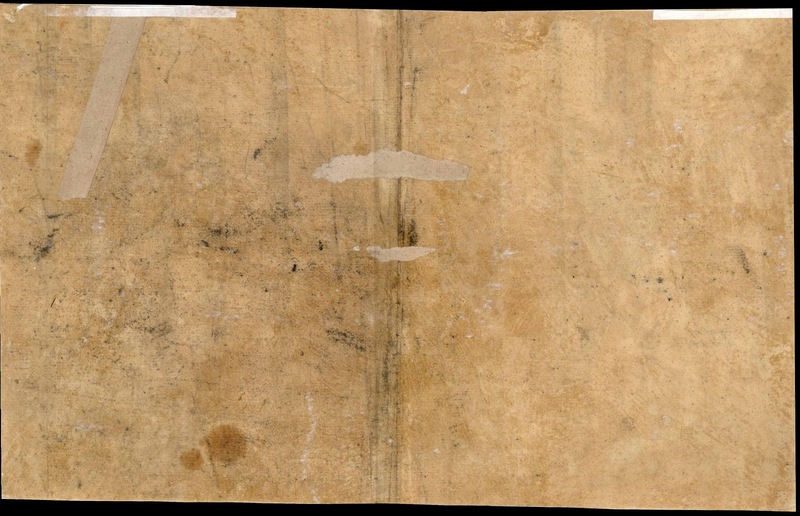 Condition: fine impression cut to the inscribed borderline. 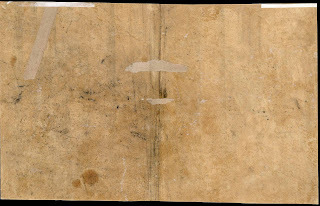 There is a horizontal repaired tear in the centre of the print with repair creases and stains more visible on the back. I am selling this print and the print of the same subject below for a combined total price of $140 AUD including postage and handling to anywhere in the world. Please contact me using the email link at the top of the page if you are interested or click the Buy Now button below. Condition: strong impression with faint age toning at edges otherwise in excellent condition. I am selling this print and the print of the same subject further above for a combined total price of $140 AUD including postage and handling to anywhere in the world. Please contact me using the email link at the top of the page if you are interested or click the Buy Now button below above. 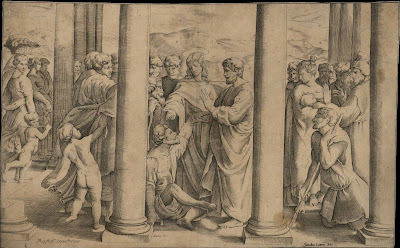 Regarding the engravers’ two different translations of Raphael’s original design (shown below), the prints are interesting to compare in terms of capturing a turmoil of movement. In the engraving after Franco Battista, the anonymous printmaker has simplified Raphael’s serpentine columns to basic cylinders. This modification to Raphael’s design matches perfectly the design construct of a straight overlaid shape that is critical to the Poggendorff illusion. 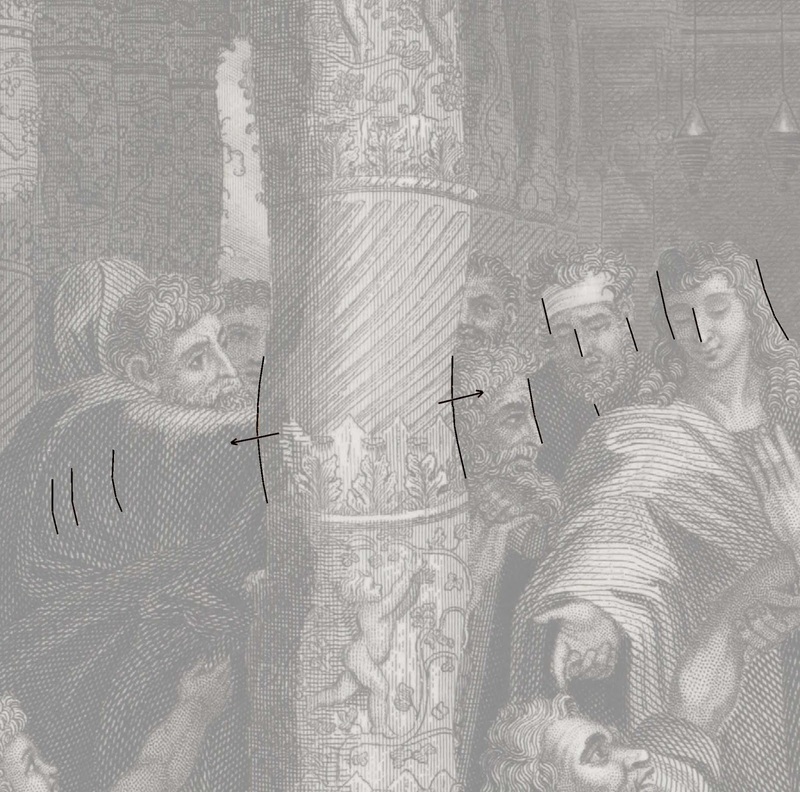 Theoretically the simplification of the columns disrupts the viewer’s reading of the figures and, arguably, triggers the idea that the figures are animated. Certainly, to my eyes the Poggendorff illusion arising from the straight silhouette edges of the columns and the misalignment of angled lines helps to connote turmoil, especially the angled lines shown in the detail below. 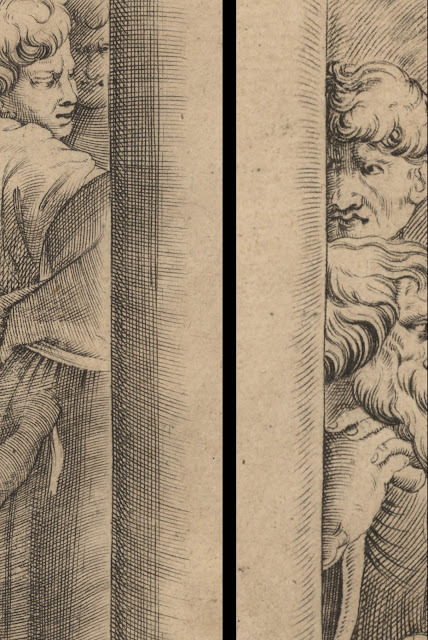 My perception of the figures being in a state of flux, however, is also driven by seeing contrast between the entwining rhythms of the figures juxtaposed with the columns’ straight sides (see the upper detail of this print further below). 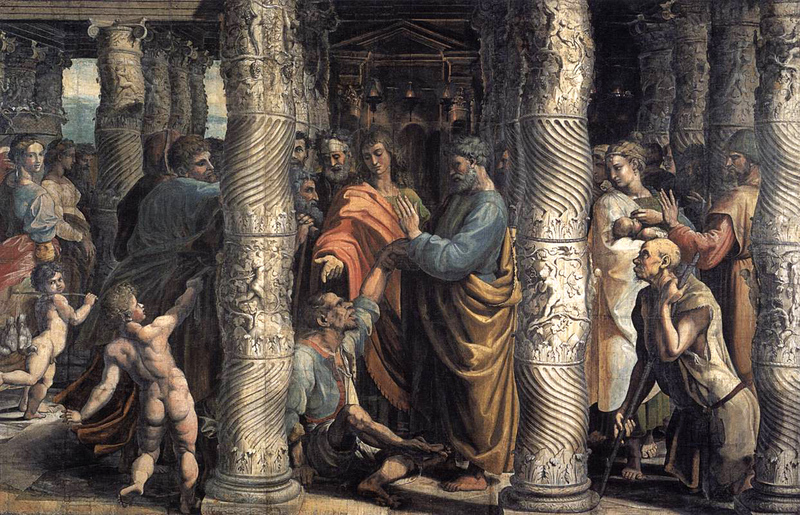 Or, to express this slightly differently, the rigidity of the columns breathes life into the figures. In Rogers’ engraving the columns are depicted with the serpentine twist shown in Raphael’s cartoon. With regard to the Poggendorff illusion, these spiralling forms deviate from the straight lines required for the illusion to arise. Indeed, the effect of the columns’ curved contours set against similar curving rhythms of the figure groups should mean that the suggestion of movement is less satisfactory than the print after Battista, but I am not convinced about this as there are other factors in play. Although the illusion has been compromised by the use of curved columns, from my reading, the effect of turmoil in Rogers’ print is just as effective as Battista’s print. 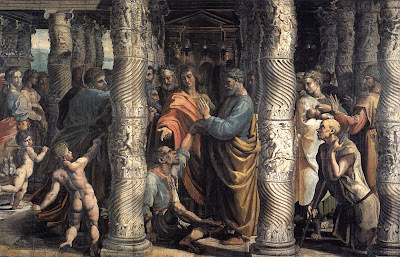 Rogers’ print may not employ the strong contrast of juxtaposed straight lines with curved rhythms, but, in following Raphael’s design, the image projects turmoil by the twisting lines of the columns echoing the rhythms of the figures. 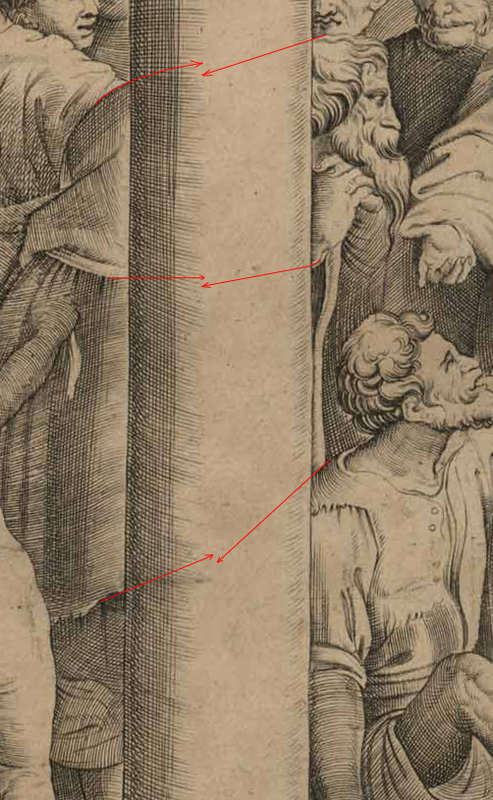 For example, in the detail of this print shown above and the diagram of it shown below, note how the bowed curve of the figure to the left of the column follows its outward swelling curve while the tilted heads of the figures to the right side of the column follow its inward curve. In short, this effect of echoed curves animates the scene as an integrated whole. 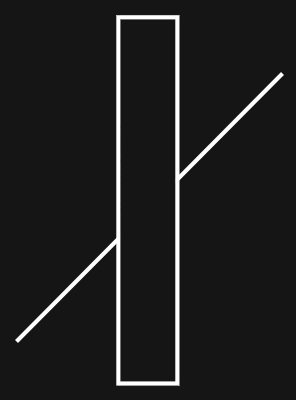 By this I mean that the movement is not restricted to the figures behind the columns but also includes the columns as part of the turmoil. 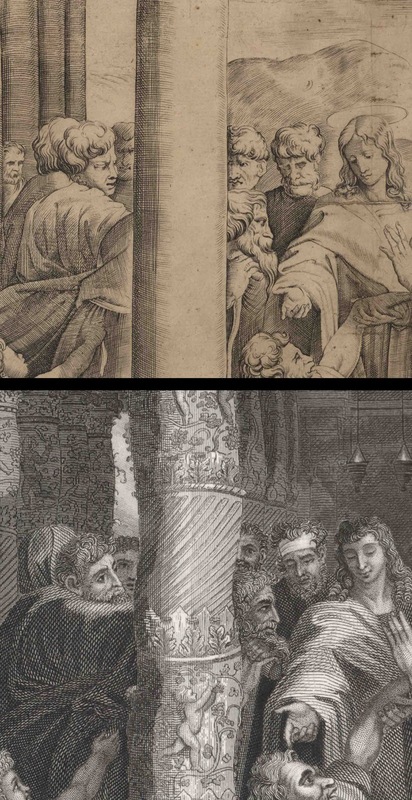 This notion of integrated turmoil in Rogers’ print between the columns and the figures behind them also relates to the way that Rogers treats the silhouette edges of the columns. 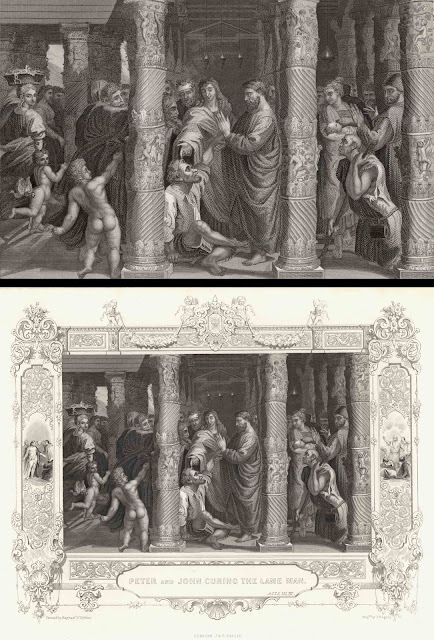 If I may compare Rogers’ treatment with the engraving after Franco Battista, for instance, the artist following Battista’s design deliberately lightens the background on the shadow side of the columns and darkens the background on their lit side (see details below); that is, the artist uses the principle of noetic space discussed in the earlier post Drawing Corners. This counterpoint arrangement of tone (i.e. when the tone of the column at its edge is dark the background is light and when the edge of the column is light the background is dark) serves to separate the two spatial zones of foreground from background. By contrast, Rogers’ engraving does not introduce this arrangement and the tones of the column and background are largely as they may occur naturally. The outcome of this natural play of light and shade is that the scene is integrated in the sense of being fused together. Accordingly, rhythms that occur across Rogers’ composition affect the whole image by breathing life into all portrayed features. In future posts I will discuss more ways to portray movement and give the breath of life to images. In the meantime the video below shows a good array of optical illusions that trigger the perception of movement.